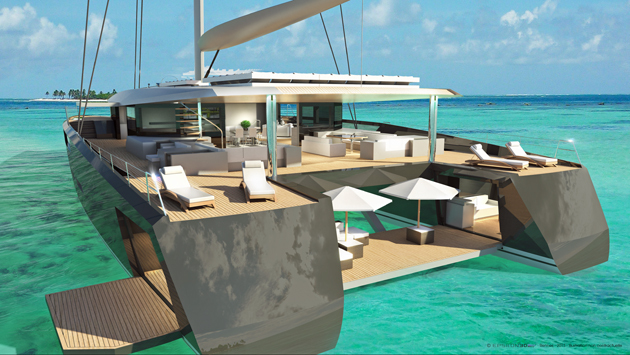 CNB's 46-metre Inno(Vent) 150 concept, created in collaboration with Berret-Racoupeau Yacht Design, offers those on board an enhanced connection with their environment. Folding balconies have been used to open up the beach club, while the owner’s apartment forward benefits from a folding terrace. “From the very first sketches, we completely oriented the lifestyle toward the sea. By maximising openings and revealing new perspectives by way of movable balconies and doors, we wished owners to be able to enjoy an exceptional view of their environment from each of the living areas,” says naval architect Olivier Racoupeau. 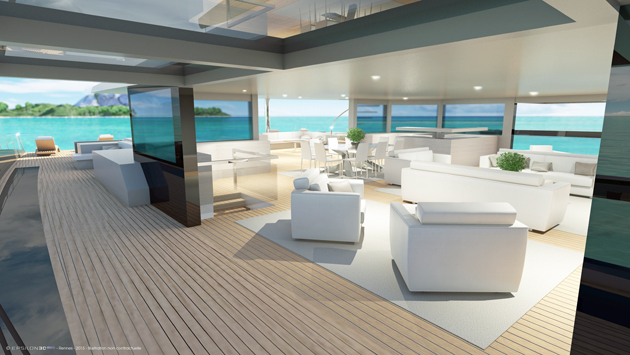 The heart of the yacht, which has been designed with blue-water cruising capabilites, is the extensive main deck. It offers indoor/outside living areas, as well as a range of options, whether guests want to be sociable or have some time alone. The owner’s area boasts a gym and a spa with sea views. Aft the beach club has been fashioned as what Racoupeau calls “a true harbour-patio”, which can be used for tender storage as well as relaxation, while the port and starboard hulls can be joined with a walkway. CNB will be showcasing the design at the Monaco Yacht Show later this month. See it on Stand QAA19.